Yesterday I moved to a bungalow up the hills, about 5 minutes walk from the beach. It's almost in the jungle. 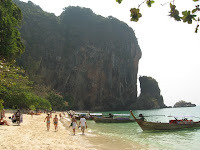 From this beach (Ton Sai) to West beach you can go by boat or walk around on the rocks at the low tide. 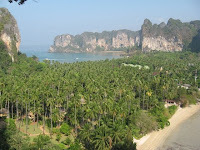 At high tide, there is a 30 minutes hike through the jungle reaching the east beach. I enjoyed this hike so I went both ways. 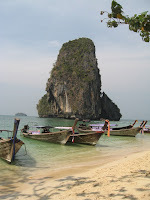 In the afternoon I stayed on Ton Sai beach, and watch rock climbers. It is probably a lot harder that it seems. Today I went for another hike, a lot more difficult. There were some ropes along the way to help. The first stop was at the viewpoint, about 100 meters above the sea level. From this point there is a beautiful view of both East and West bay. The second point of interest was the lagoon, situated in the middle of the mountain, surrounded all around by 100 meters cliffs. 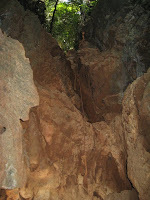 The down climb to the lagoon was difficult and in some places dangerous, a couple of 5 meters almost vertical drops where was just the rope to help descending. I believe watching the Discovery Channel helped here, so I always maintained 3 points of contact, used the force of the legs rather than arms. Anyway, made it all the way down. 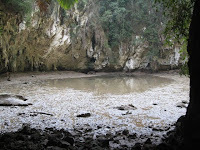 I was expecting to find a crystal clear, very light blue lagoon, instead I found an almost dried up pond, muddy and rather ugly. The cliffs surrounding this lagoon made me feel like I was on the bottom of a cooking pot. The echo was great. I was disappointed by the lagoon, but the challenge of getting there was so great, I didn't feel sorry a bit. Climbing out of the lagoon was easier, maybe because I could see where I can put my feet. 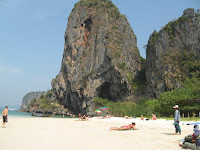 After I got down to the see level, I went along the cliffs and I came cross the forth beach, Phra Nang. I have found it the most beautiful beach on this peninsula. Youa re waling and climbing a lot. How are you with phisical condition?